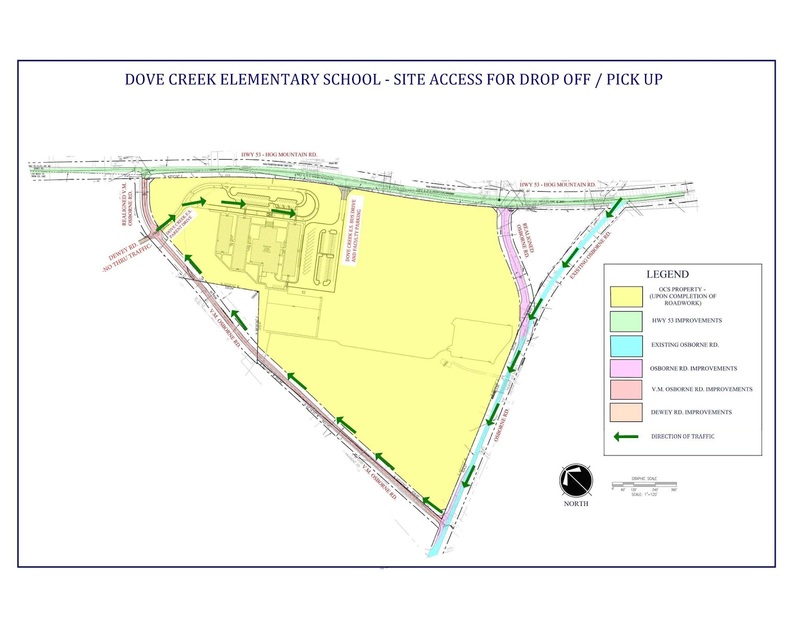 Parents dropping their children off at Oconee County’s new Dove Creek Elementary School for the first day of classes on Wednesday will use the school’s entrance off the newly paved V.M. Osborne Road. Buses will use another entrance directly off Hog Mountain Road. School administrators assured Board of Education members at their regular meeting last week that the school would be accessible for the opening of school even though road work around the school is not scheduled to be completed until the end of October. The School System has released a map to help parents find their way from Hog Mountain Road, along Osborne Road and then V.M. Osborne Road, to the drop-off point for children. The Board got to experience at the official opening ceremony for the school last week what parents and bus drivers will experience on opening day. 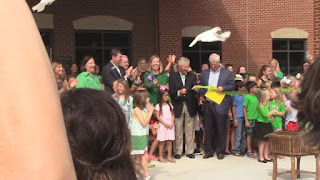 An estimated 300 people, including incoming students, showed up that day as Board members joined school administrators in cutting the ribbon officially opening the school’s doors to the public. Two years ago, Branch said, Dove Creek was just a dream. All five members of the Board were in attendance, as were teachers and Dove Creek’s new principal, Susan Stancil. Caged, white doves were released as the participants cut a ribbon at the school’s entrance. When roadway construction is complete later this year, parents will use the same entrance to the school as they will use at the School’s opening. At present, parents will have to backtrack along V.M. Osborne Road and Osborne Road to reach Hog Mountain Road as they leave the school. In the future, they will be able to turn right on leaving the school and then turn right or left onto Hog Mountain Road. The short section of V.M. Osborne Road from the school entrance to Hog Mountain Road will be one way, however, and no traffic will be allowed to access the school from Hog Mountain Road without also using Osborne Road. 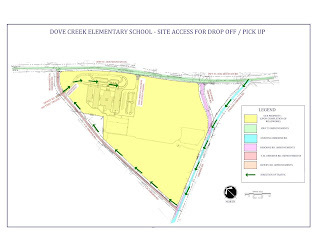 Oconee County Public Works Director Emil Beshara told me in an email exchange earlier this month that a temporary barricade will be erected at the intersection of Dewey Road and V.M. Osborne Road to prevent access to the school via Dewey Road. Dewey Road is not paved, and Beshara said it could not handle additional traffic if parents used it to access the school. V.M. Osborne Road also was a gravel road prior to opening of the school. Brock Toole, chief operations officer for the schools, updated the Board on the road construction at its meeting on July 23. The School System learned late last year that a high pressure gas pipeline ran along Hog Mountain Road, and the road work for the school entrances has been delayed as a result. Toole told the Board that he has been told by the county that the road work will be completed by Oct. 26 at the latest. In other action at the July 23 meeting, the Board approved an amended budget for General Fund expenditures for the just completed fiscal year. Saranna Charping, chief financial officer for the School System, said the budget reflects a $1.8 million surplus. Charping also said that $1.1 million from the General Fund will be used to pay for part of the $2.2 million cost of replacing the natural turf at the county’s two high school stadiums with artificial turf and redoing the tracks at each of the stadiums. The remainder of the money for the stadium improvements will come from the Education Local Option Sales Tax. I was not able to attend the ribbon cutting ceremony on July 24 because of a medical appointment, but Sarah Bell did attend and recorded the video below. I did attend the Board of Education meeting on July 23. Charping made her report beginning at 8:13 in the video below. Toole made his report at 15:11 in the video below. OCO: Dove Creek Ribbon Cutting 7 24 18 from Lee Becker on Vimeo. OCO: BOE 7 23 18 from Lee Becker on Vimeo. Just to be, somewhat, cynical. Great planning Oconee County. Building a school to completion, then finding that there is a gas main line in the driveway? Now, do the tax payers have to pony up for your ignorance?